Charles II, Duke of Brunswick (1804 – 1873) (aka Charles d’Este-Guelph) inherited the throne as a child after his grandfather and father died fighting (the battles of Jena and Waterloo). Prince George (of the United Kingdom and Hanover) became his guardian. 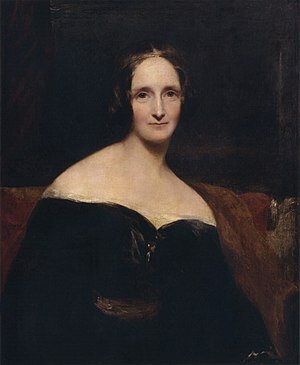 Between disputes his age of majority Charles’s invalidation of some laws (made during his minority) caused friction. Apparently, he had his fair share of “indiscretions” too. 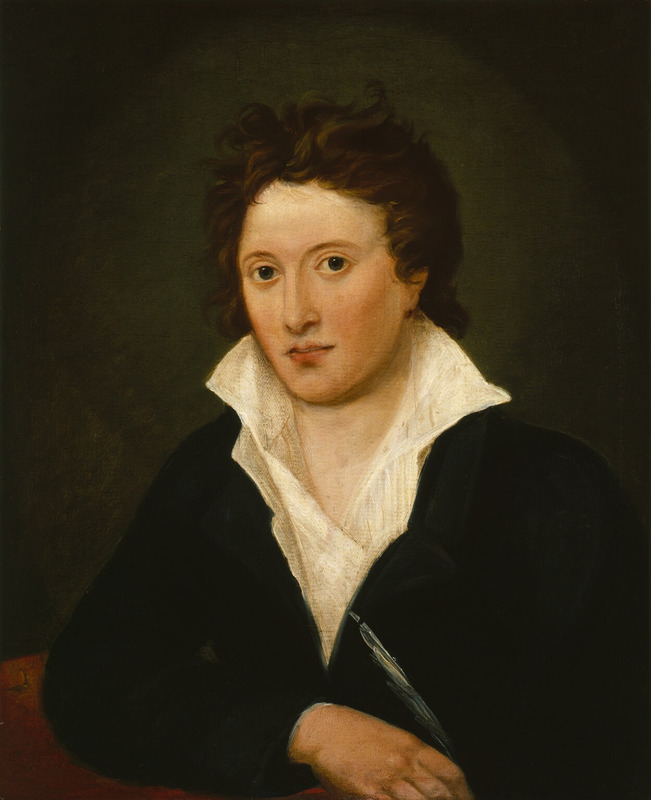 In 1830, he lost his throne and was exiled. Obsessively focused on recovering his lands, he allied himself with anyone he could to get it back. 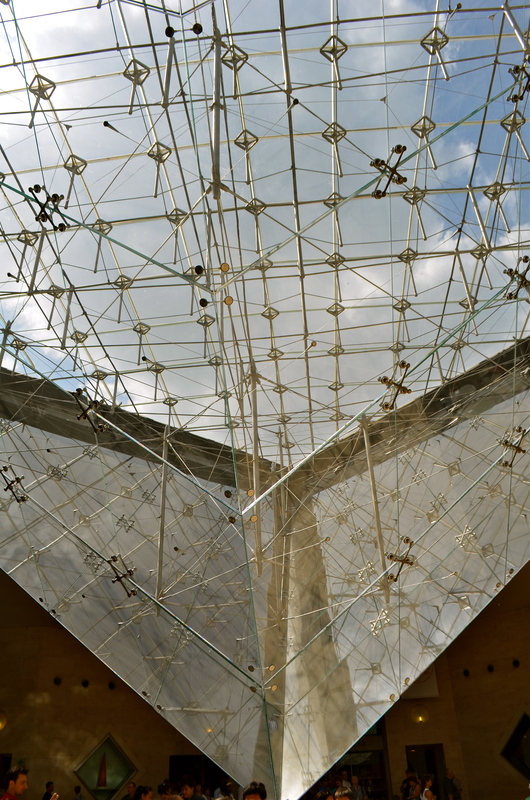 He moved to Paris, where he built a huge palace that was way ahead of its time. While it didn’t have a moat, it had tons of security features including giant walls, hidden spring guns that guarded valuables, and other unique apparatuses. It didn’t, however, have a cook. Since the Duke was a bit paranoid, he ate out. Since he sounds like such a normal guy, such an average Joe, you won’t be surprised to learn that he had a memorable appearance. He was a heavyset fellow who wore elaborate costumes that were lavishly decorated with diamonds. Once, he told some broads that he even had diamonds sewn on his undies! No word on whether they accepted his invitation to see his bling. When the Franco-Prussian War (between France and Germany) broke out, Brunswick moved to Geneva. He died in the Beau-Rivage Hotel there in 1873. He left his bequeathed his fortune to the City of Geneva with one condition. He requested they build a monument to his memory and specified that it be a replica of the Scaliger Tombs in Verona, Italy. The city used the money to build the golden gates of Parc des Bastions and the city’s opera, the Grand Theatre. Why Geneva? Although he had an illegitimate (but acknowledged) daughter, he broke ties and removed her from his will when she converted to Catholicism. Some say that the lawsuit he lost requiring him to support her was the real reason he left Paris. Paris’s loss was Geneva’s gain. In 1979, Geneva built the Brunswick Monument near his final home at the Beau-Rivage Hotel (also near the other five star hotels the Richemont Hotel and the Hotel de la Paix). 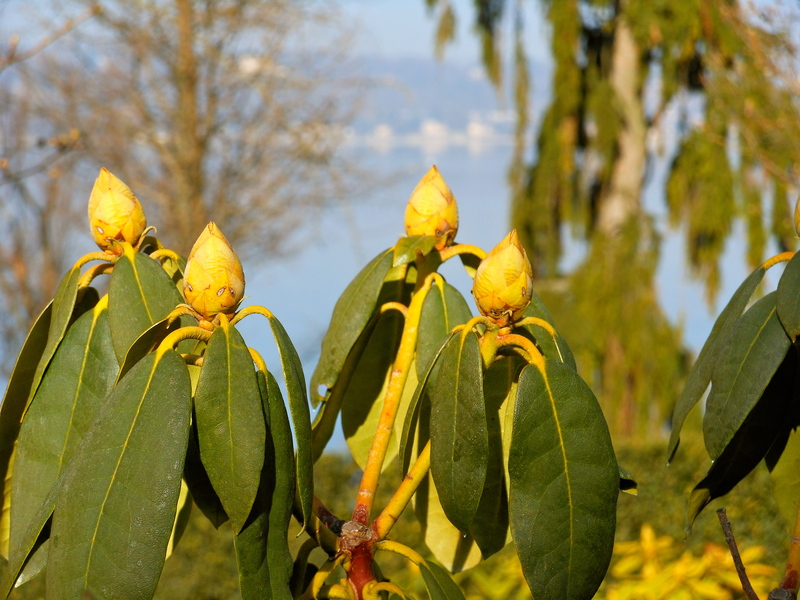 It is impossible to miss if you walk along the Paquis side of Lac Leman (Lake Geneva). The inscription on the monument reads: “The Duke of Brunswick, Charles Frederick August William, was a distinguished linguist, horsemen and musician was born 1804. He dethroned and chased out in 1830 and thus, took refuge in Paris, but spent his last three years back in Geneva. Mr. Charles Frederick August William was an eccentric and a paranoid. His death in 18 August 1873 provided a tidy sum for the city Geneva. But in his will, Geneva, as his residuary legatee must provide his final resting place that is in ‘an eminent and worthy location, executed according to the established concept by the finest artists of the time, without consideration of cost”. I was surprised when, on the way to the grocery store (it’s in the street between Migros and the Co-op at Eaux-Vives 2000 across the street), I saw this in the road. 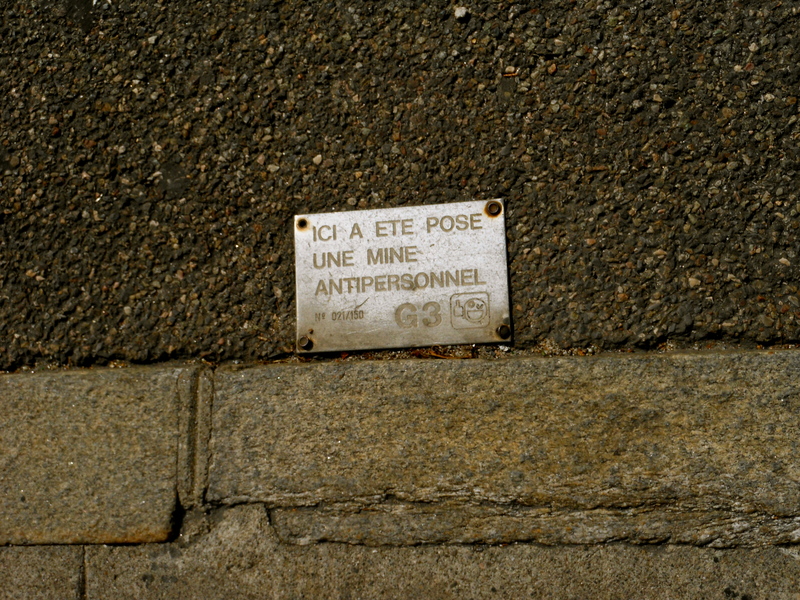 It reads “Here laid an anti-personnel landmine.” It stopped me dead in my tracks. A land mine? In Geneva? Has anyone else noticed this? Does anyone know anything about this? I’d love to know who placed it there and why. During the second world war, Geneva was virtually surrounded by nazi-occupied France. Switzerland developed the National Redoubt plan to defend the country from the Nazis, but everyone knew that Geneva would have been left to occupying forces as it was not easily defended. Landmines as we know them were developed during World War II (1939 – 1945). They were widely used as anti-tank devices. Smaller anti-personnel mines prevented the removal of anti-tank mines. Even today, some land in France is not useable because of the mines on it. Could it be from that period? Since World War II the proliferation, production, sale and trade in landmines grew. Today, there an estimated 110 million anti-personnel mines in the ground around the world, another 100 million in stockpiles and 5-10 million more mines produced each year. The Swiss Confederation signed and ratified the Convention on Cluster Munitions. 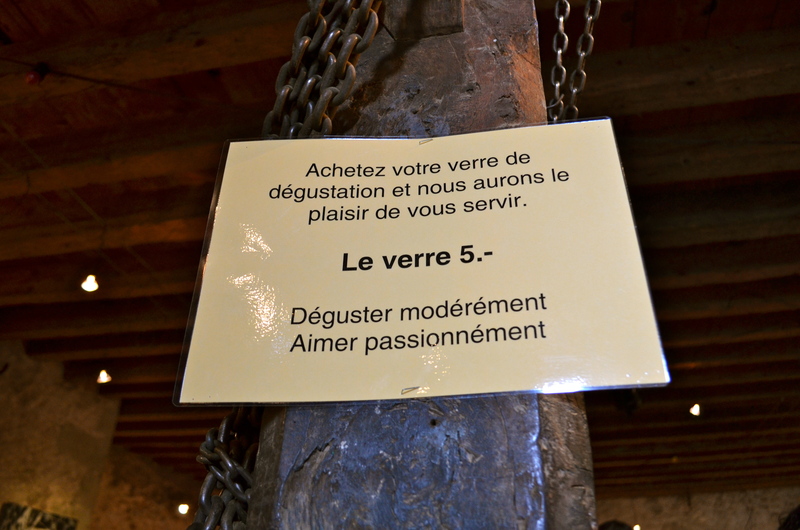 It took effect on the 1st of January 2013.
is an historical passage in Geneva’s old town. You enter at the top of the Rue du Perron (by No. 19) and exit off the alley Monetier, at the base of the old ramparts. The passage zig zags between medieval buildings for around 100 meters (328 feet), narrowing to 50 cm (20 inches)! 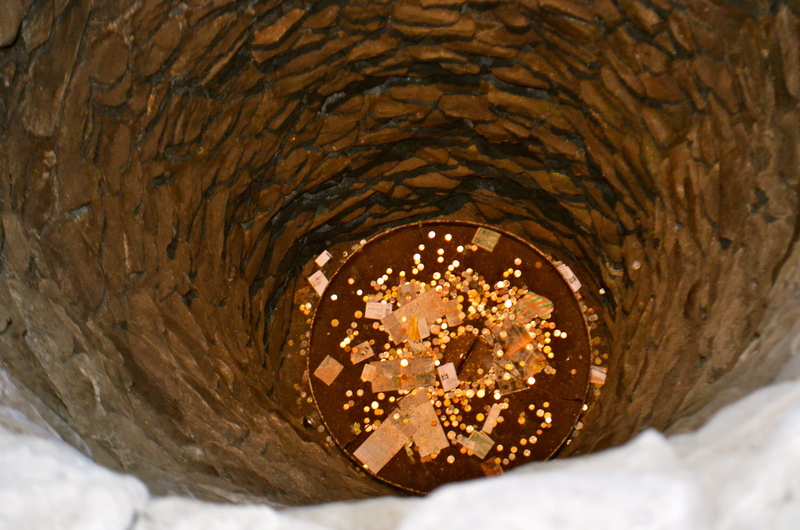 Given layout between residential buildings, darkness and narrowness, it’s not surprising that this secret passage is open to the public only during the last two days of Geneva’s Escalade festivities. The rest of the year, it is closed. Get in on the action this weekend while you still can! Occupied since Roman times, Geneva is ancient. 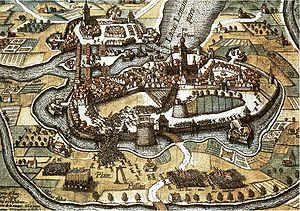 Over time, Geneva grew and extended its fortifications. 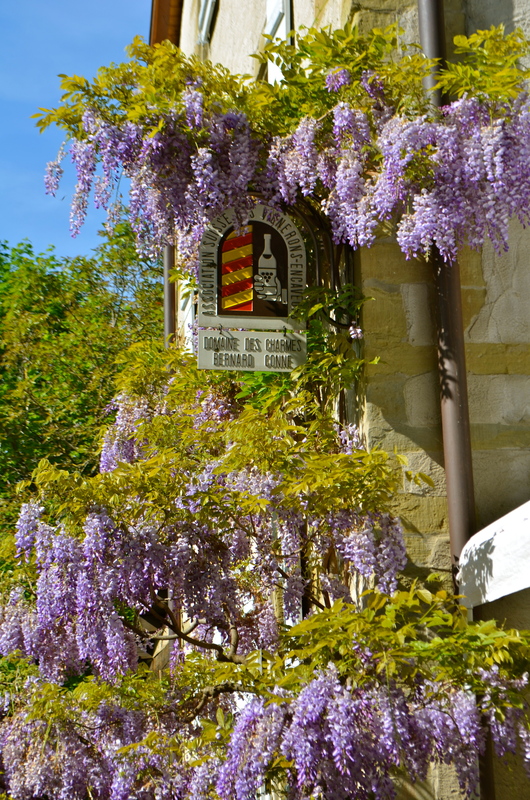 The passage began as a simple path between early fortifications sometime during the 600-1100 A.D. that protected the hill of Saint-Pierre (on which Cathedral St. Pierre sits). 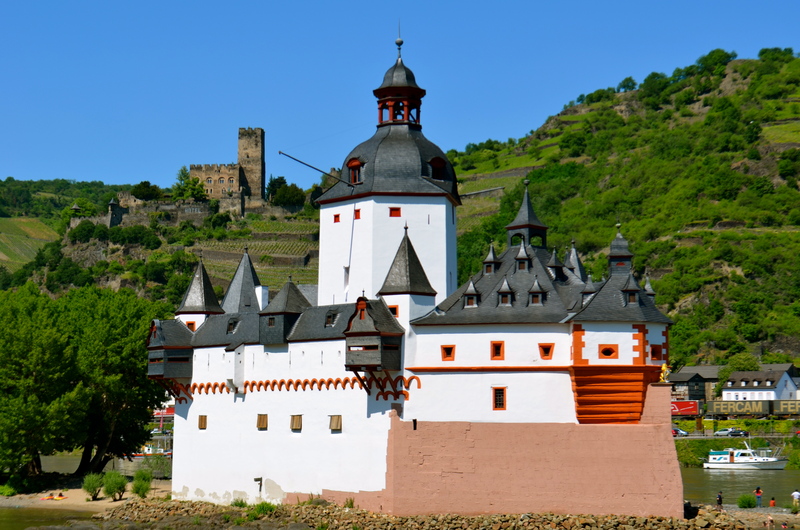 In the Middle Ages buildings weren’t glued to each other. 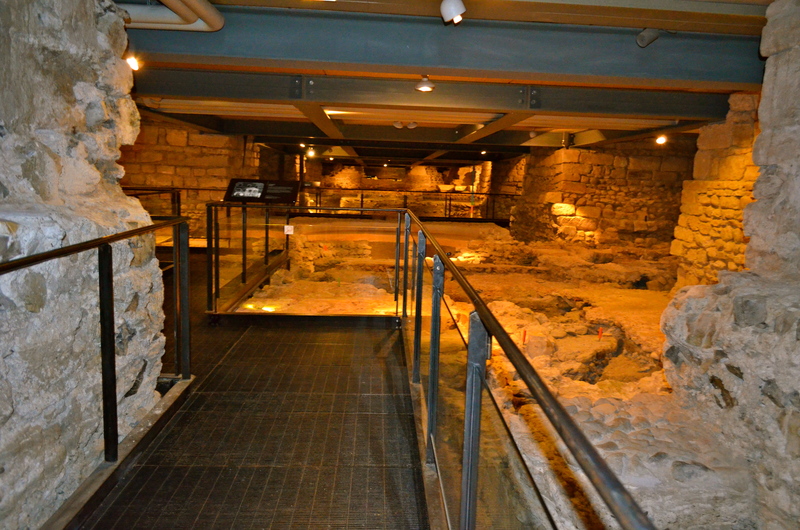 As new fortifications and buildings were built, Passage Monetier became a passage or alley. It took on its current route around 1300-1400 A.D. and allows access from one neighborhood to another without detours. Without indoor plumbing alleys served as an open sewers and it probably didn’t smell great. The Savoyards came along the Aarve River, assembled at Plainpalais and attacked from the back of the city. There’s an urban myth that says the passage had something to do with the surprise attack by Savoyard troops sent by Charles Emmanuel I, Duke of Savoy during the night of 11–12 December 1602 to attack Geneva. Alas, it is just that, a myth. Neither attacks, nor the battle that night took place near there. 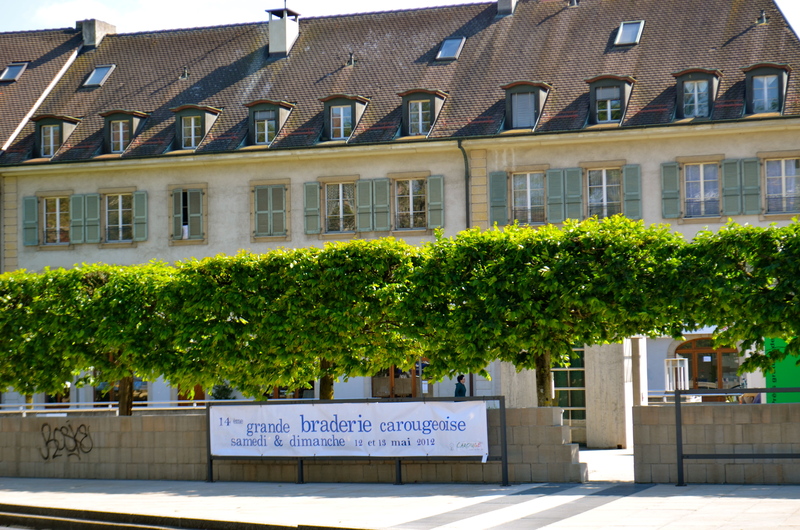 Its opening merely serves as one of the festivities comprising L’Escalade festival which celebrates Geneva’s win and usually occurs in 12th of December. Geneva is old. Really old. The Allobrogians built a fortified settlement in Geneva that was conquered by the Romans in 120 BCE. For me, pre-Roman = old. Located at a strategic location between Lake Geneva (Lac Leman) and the Rhone, Julius Cesar came to Geneva on his Gallic campaign in approximately 58 BCE. From the 1st to 4th centuries, they built a large building close to where the St.-Pierre Cathedral now stands . 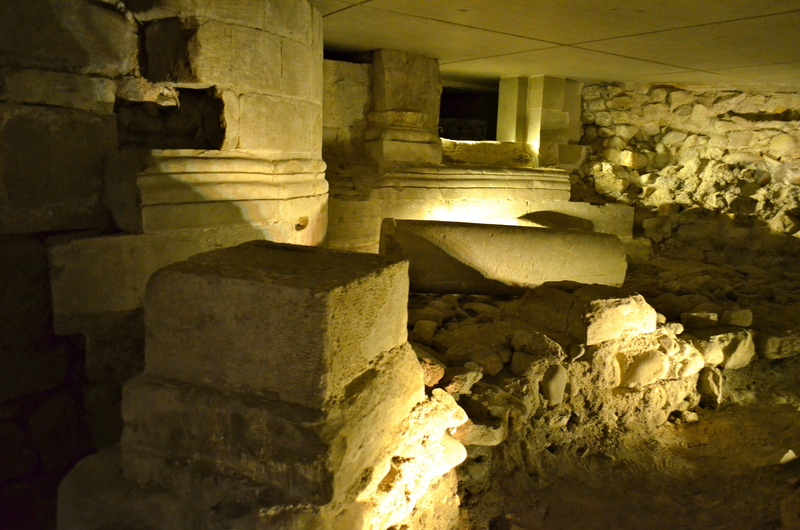 Under the St.-Pierre Cathedral, in the crypt is an archaeological site. 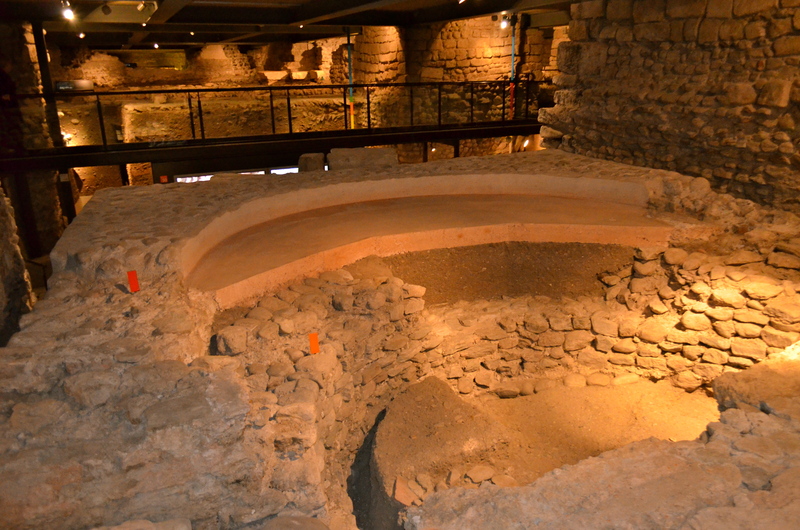 The foundations of those original buildings are still there. You can see the layers of building. In the photo above, you can see the original monk’s cells on the left. Cozy. The site is massive, with many levels. 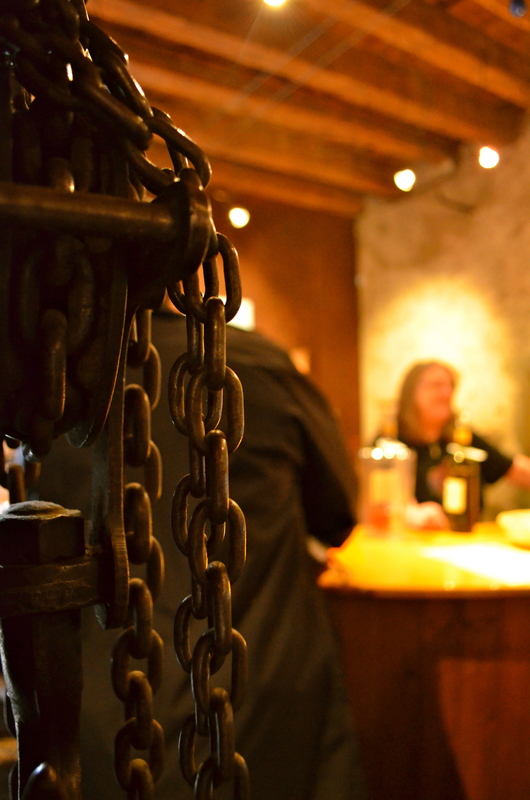 Some of our guests missed seeing an entire part of it when they took a wrong turn. When I went back to look for them, I stumbled upon this gentleman (or lady). 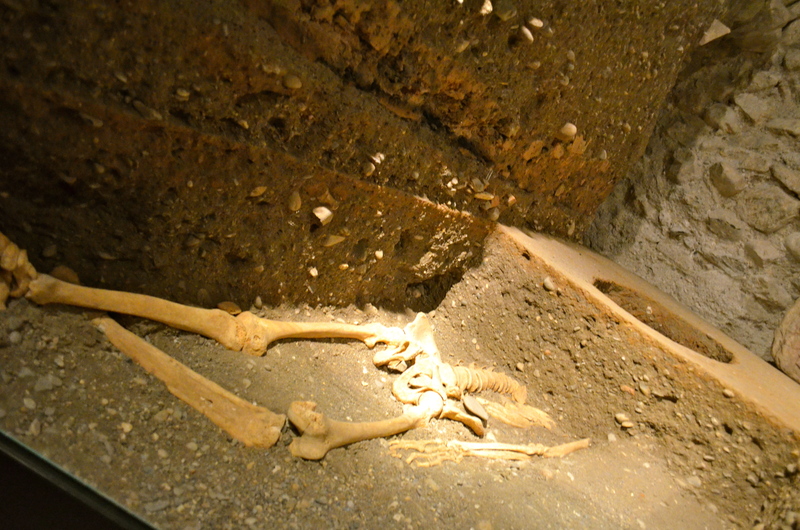 The hole is from the excavations searching for his or her head! 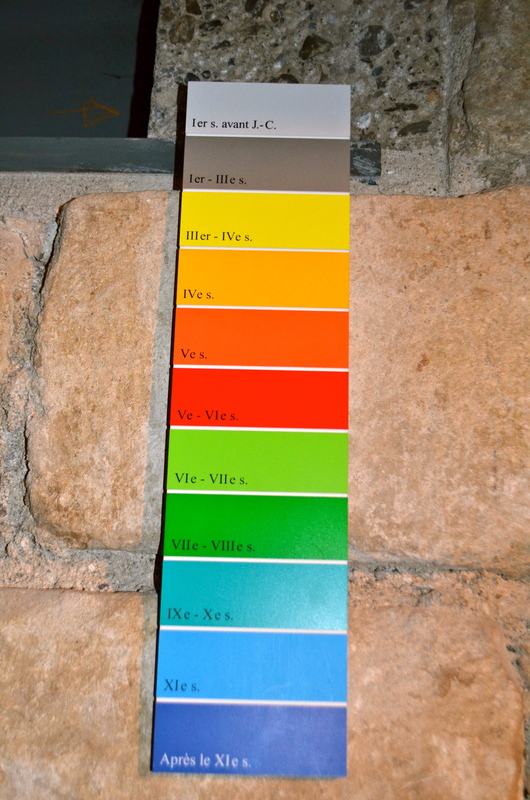 With so much history piled up in one spot, they have a handy color coded system to help you determine the age of what you are seeing. The colored sticks correspond to different time periods. 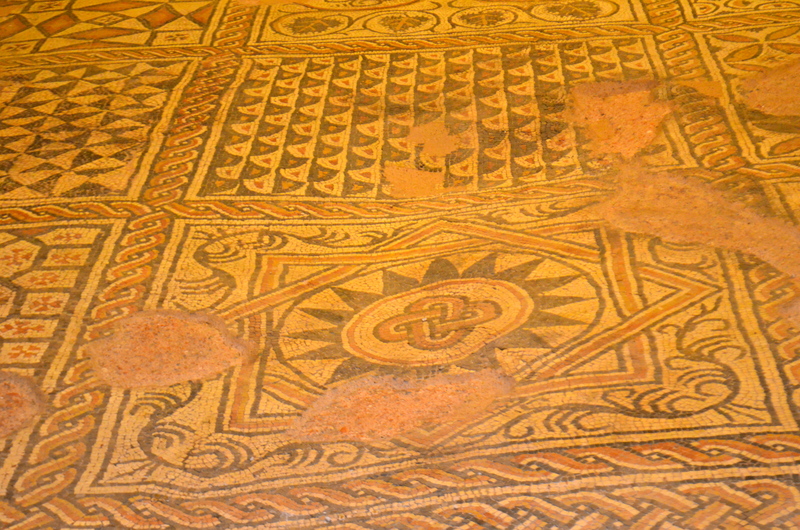 There’s plenty of evidence of the Romans, from mosaic floors to coins to wells. 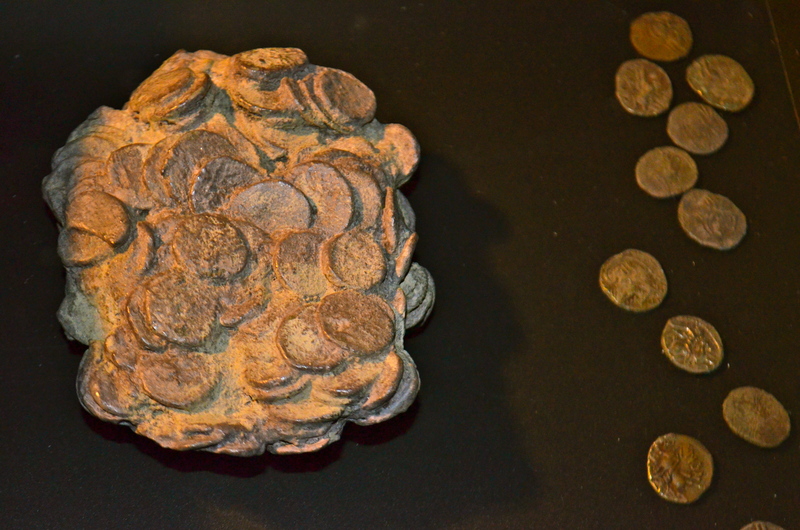 I don’t think the coins at the bottom of this cistern date from Roman times. I tossed one in. It couldn’t hurt. 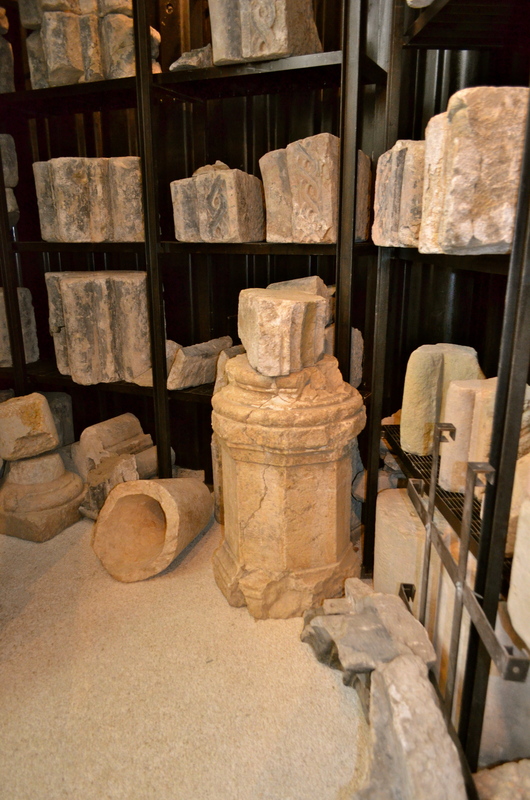 In the 4th–5th century, as Christianity spread across the Roman Empire and the cluster of buildings on the hill began to include places of worship. In 443, the Burgundians (a tribe of barbarians who invaded) took over Geneva. 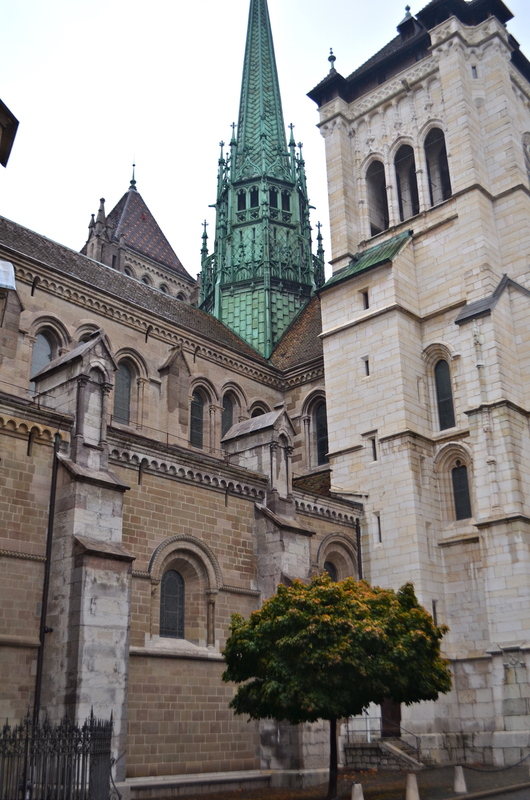 They made Geneva one of their capitals and the city contented to develop. The site also developed encompassing multiple uses. By the 9th century, cluster had grown significantly and undergone fundamental changes. 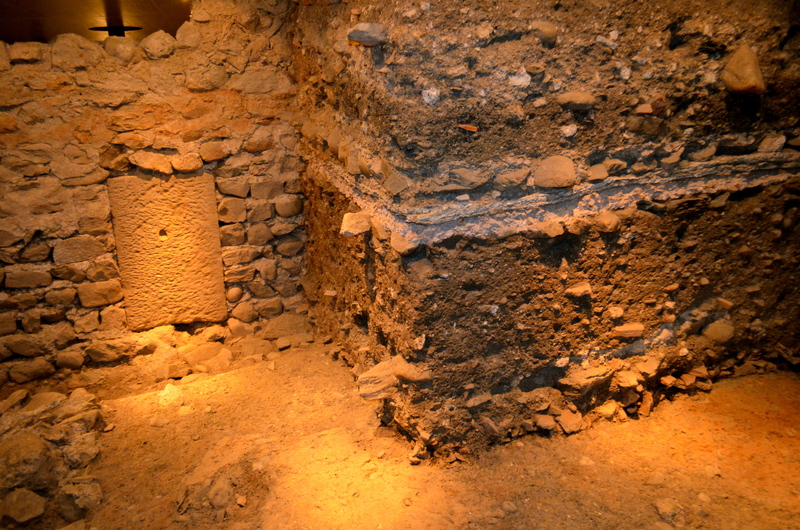 Three places of worship and annexes were built in the 4th–5th centuries. 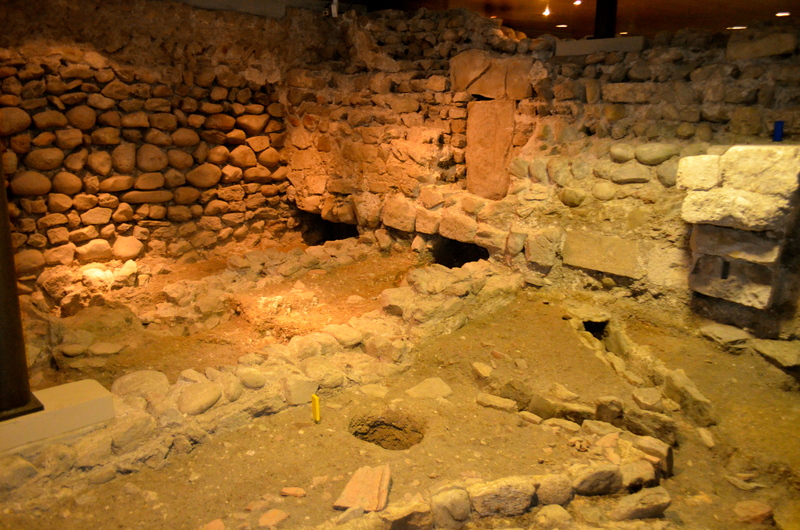 These early christian churches have been extensively excavated. 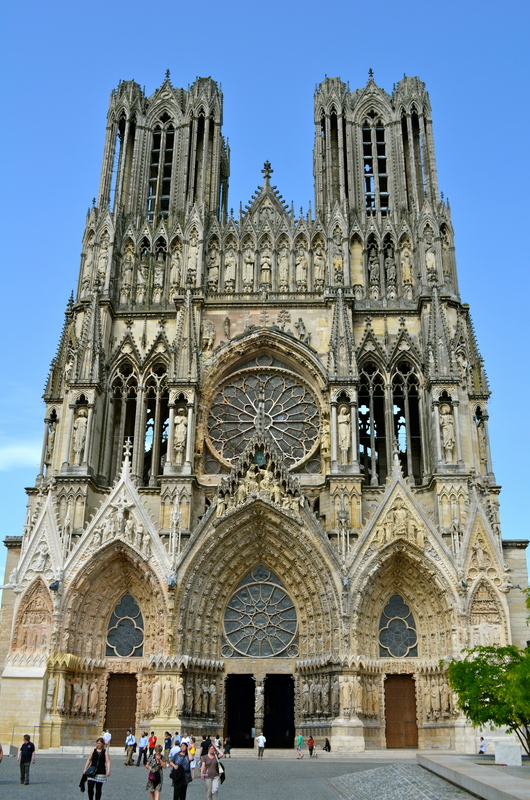 In the 7th–8th centuries, a larger cathedral was erected. In 1000, a monumental crypt was added and the choir extended. The bishop built a himself a residence, a palace for him to live in. Of course he did. 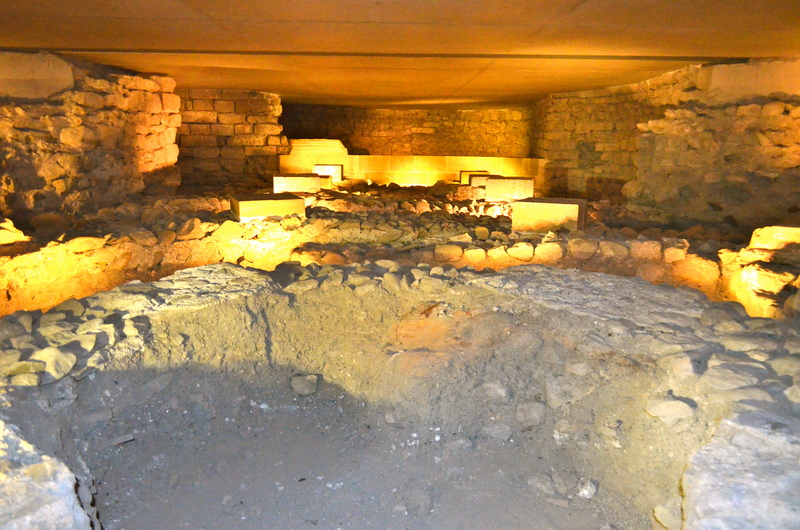 This is the crypt of the original Romanesque church. That’s the end of this tale from the crypt. He left for work and forgot his wallet (with his public transport pass inside). Wouldn’t you know it, that was the day the TPG (Geneva Public Transport) decided to check passengers for their passes. In Geneva, you don’t have to show a ticket to get on a tram or bus. Periodically, TPG officers will board busses and trams to check tickets. They issue steep fines to riders without tickets. Riders without any form of identification (to properly issue the fine) are taken into custody! He had enough identification on him to allow them to check and see he had a TPG pass. He received a fine that he will not have to pay if he brings his pass to the TPG office. 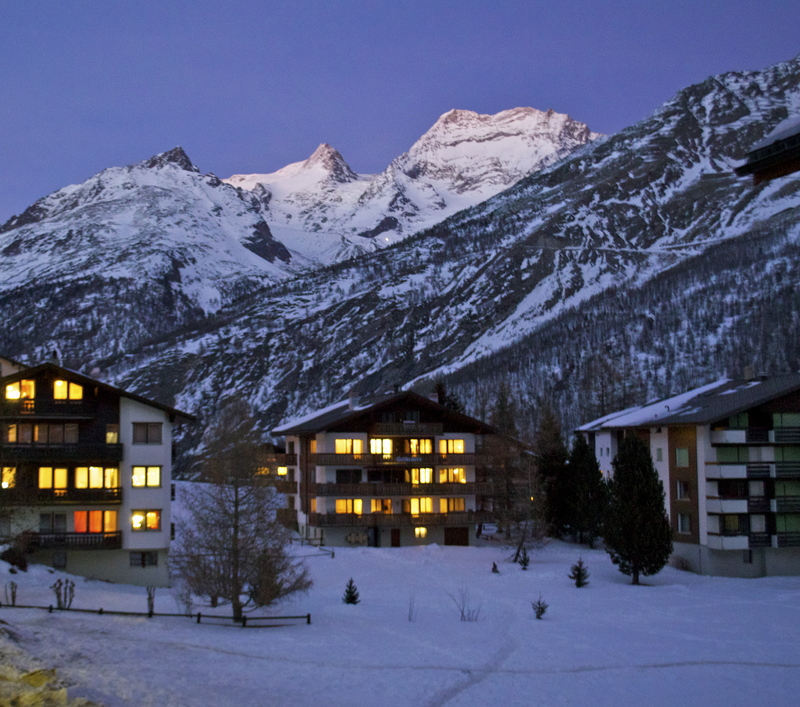 Of course, this being Switzerland, you still have to pay a small fee. On a side note, I heard a hilarious story about one of the TPG checks. It seems to be some sort of urban legend here. Who knows whether or not it is true? A woman took the only available seat on the tram next to an immigrant. She began complaining loudly about immigrants, how they should go back home, and how generally horrible they were. TPG officials boarded that tram and began checking tickets. Immediately before the officials came to check their tickets, the man about whom she had been complaining grabbed her small paper ticket out of her hand, popped it in his mouth, quickly chewed and swallowed it. When the officials came, she was without a ticket. Proclaiming her innocence and claiming the man next to her ate her ticket was not enough to prevent her from being issued a fine. Everyone who witnessed the incident remained silent, having been so offended by her behavior and remarks. La Jonction is the point where the Rhône River and the Aarve River converge, their confluence. 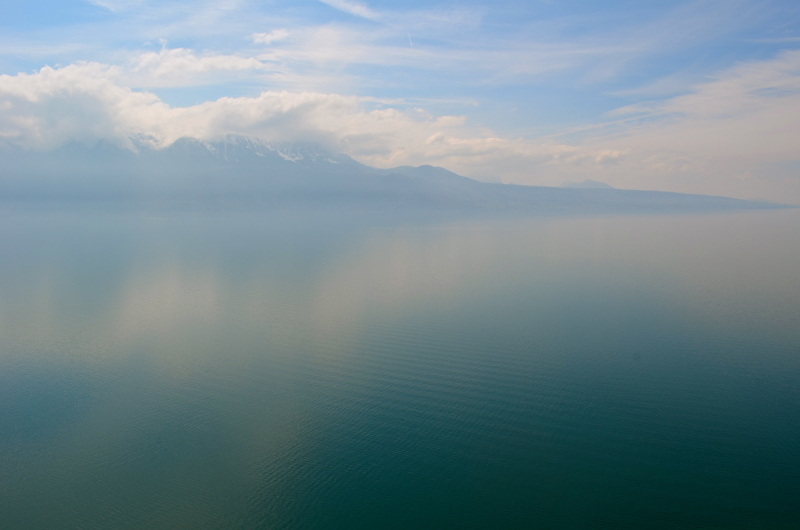 The Rhône descends from the Alps (the Rhone Glacier in Valais) into the far end of Lake Geneva (Lac Léman). The water is then filtered while passing through deep Lake Geneva, coming out the other end an even clearer, brighter blue. 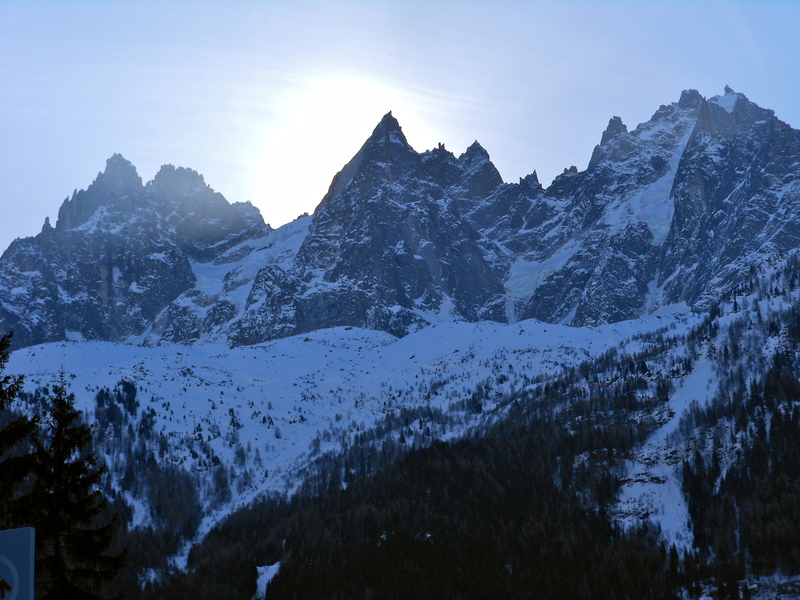 The Aarve is snowmelt directly from the Alps and is still full of sediment. Since it didn’t spend time in the lake being warmed by the sun, it is also much colder. Last August, I dipped my finger in in. It was over 32 degrees (0 Celsius), but not much. Bbrrrr. Our friends rafted down the Rhône and said that the bottom of their raft became noticeably cooler after the confluence of the Aarve at Jonction. They can see the drastic difference in their color and sediment at the point where they meet. I’ve heard it described as Blue Curacao next to Bailey’s Irish Cream. 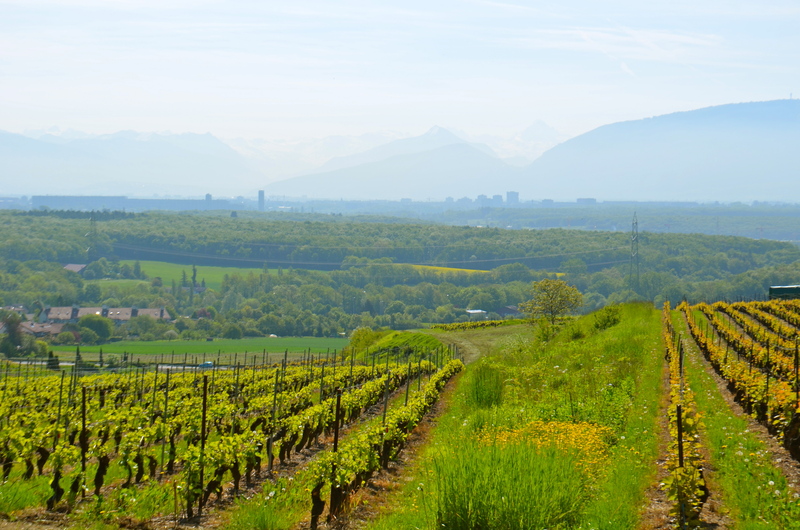 After they join, the Rhone becomes greener and cloudier. There is a lot of natural beauty in Switzerland. If Jonction were located elsewhere, it would probably get more attention. 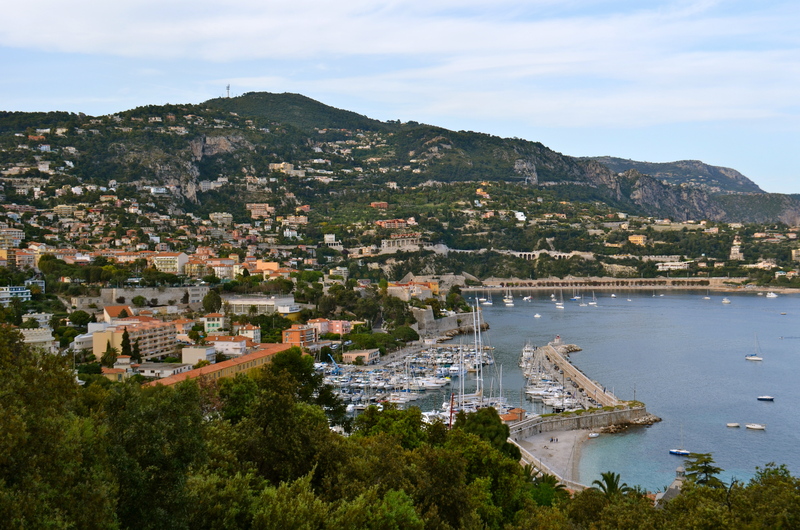 Here, it has to compete with stunning mountain ranges and crystal clear lakes. 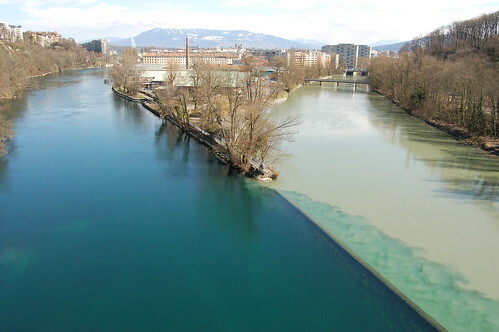 Jonction is also a neighborhood in Geneva, located near the rivers’ confluence, one side is bordered by the Rhône and another by the Aarve. By the way, if people tell you to meet them at Jonction on a hot day, make sure to bring a swimsuit. The Rhône side of Jonction has a giant grassy area where people picnic and sunbathe. They jump in the river and float downstream to cool down. Oh yeah, they also jump off of bridges. We’ll do it again soon. 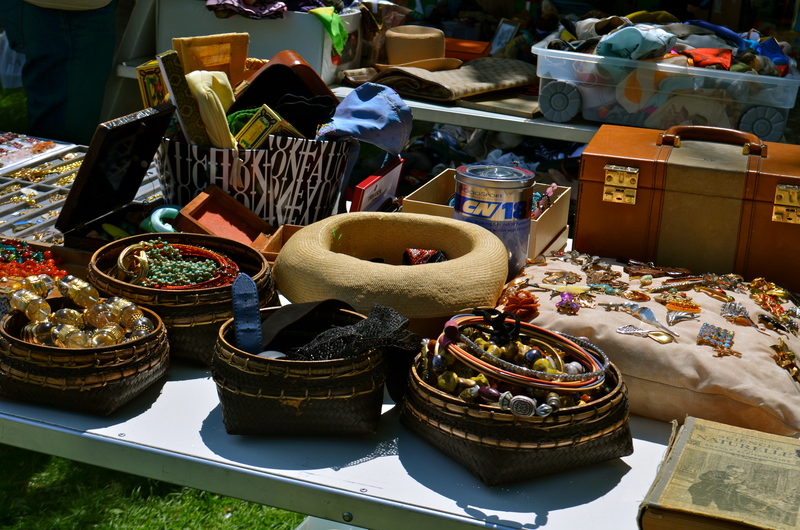 In English, terms like into attic sales, flea markets, secondhand, garage sales, car boot sales, all mean cheap prices on used stuff. 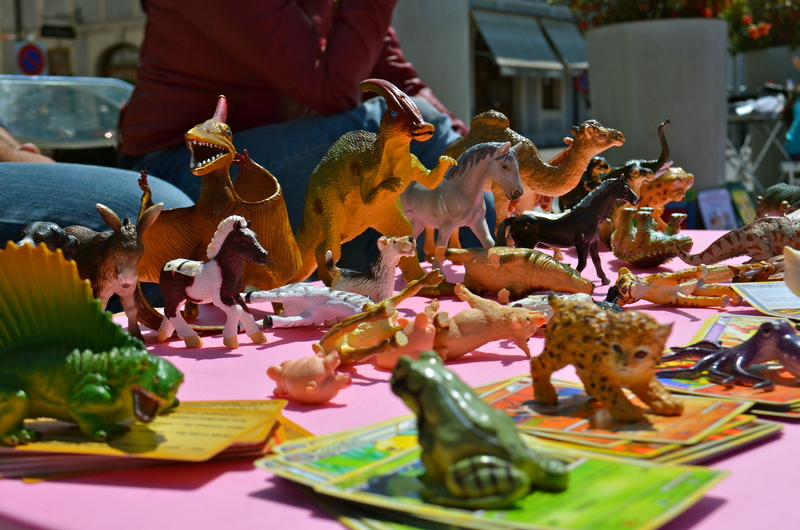 In French, terms like brasserie, vides greniers, marche aux puces, brocantes, all mean about the same thing. 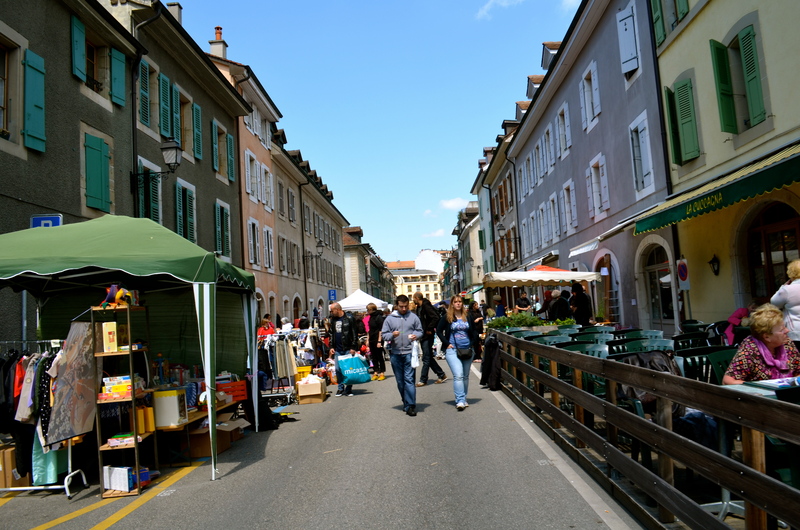 In 1754, Carouge, just beyond Geneva’s city limits, was granted to Victor Amideus, King of Sardinia. It became a refuge for Catholics, less puritanical Protestants, and even Jews. Its streets are laid on a grid pattern with lots of trees and planters. The city has low Mediterranean style buildings and interior courtyard gardens. We like to go for a stroll there and aren’t the only ones. It’s become a trendy ‘hood. 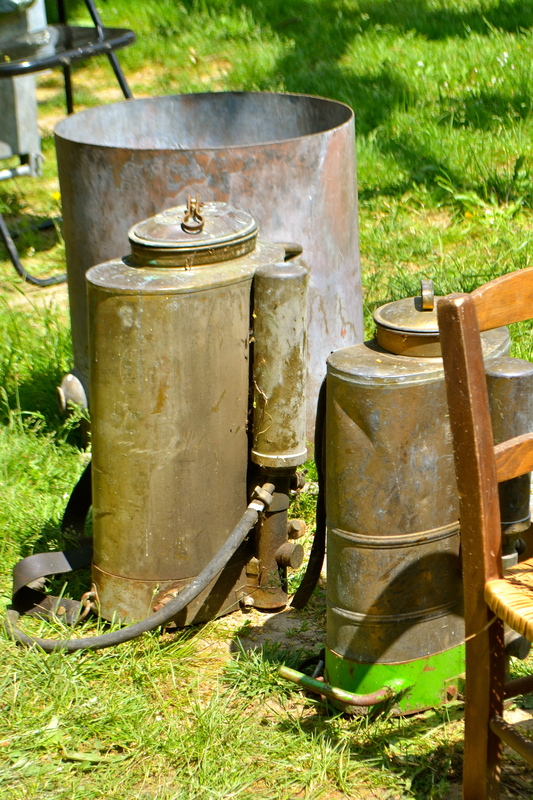 Some people have a problem with buying or using people’s old stuff. I have no such compunction and am a sucker for these sales. This one didn’t have much furniture (which is fine because I don’t have much extra space), but had a lot of everything else including Mexican food (which is a rarity here). 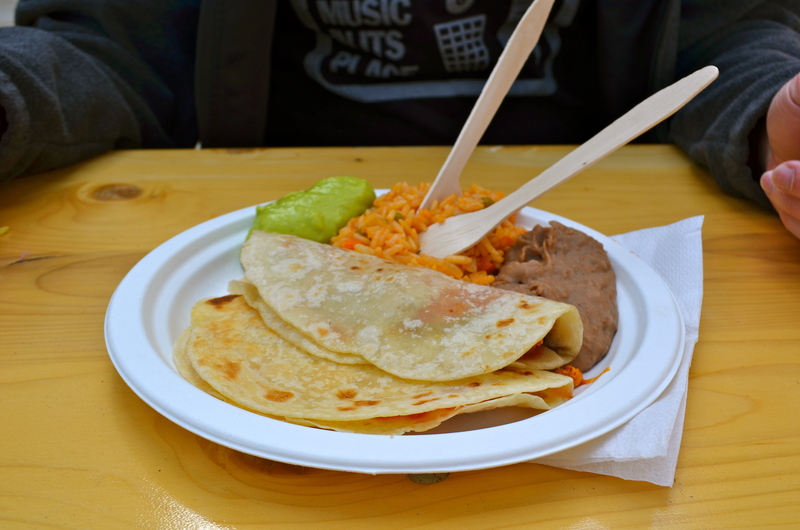 It was great, but perhaps the least spicy Mexican food ever. 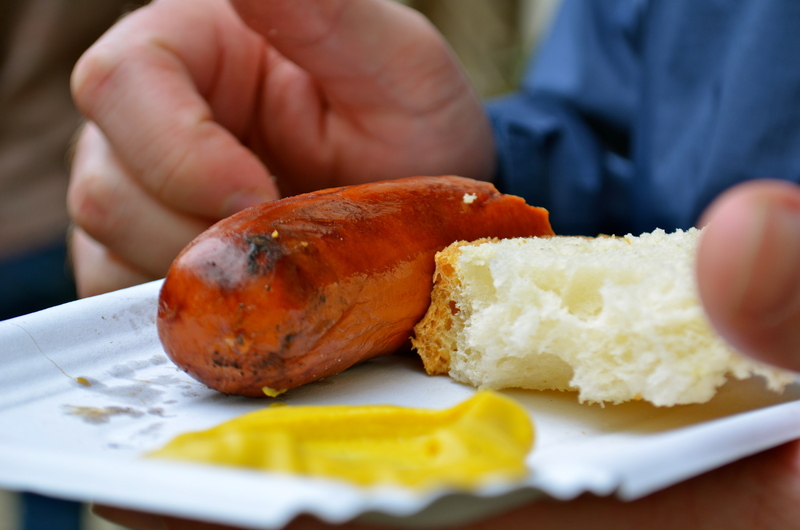 The Swiss don’t eat spicy food and so most foreign food is toned down for the Swiss market. We didn’t care. I have a supply of assorted hot sauces at the apartment. If you come visit us, please bring more. We don’t have children, but I wanted to buy some of the toys anyway. 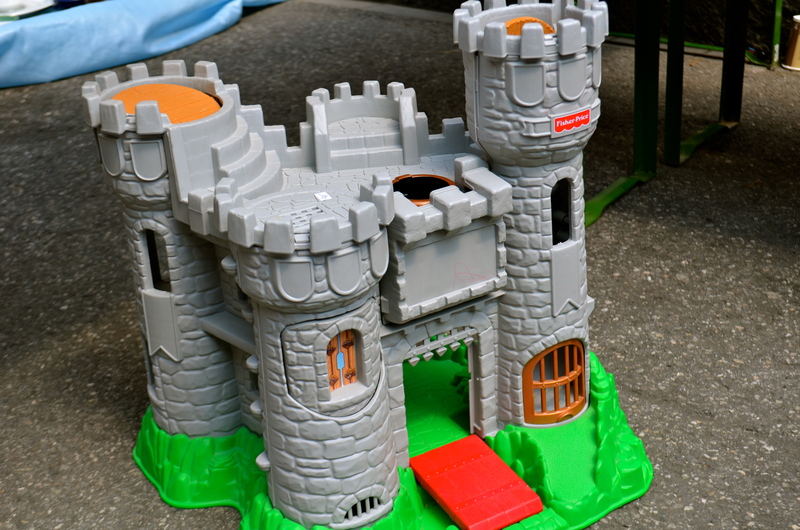 When I was young I had one of the Fisher-Price castles like the one below and loved it. It was hard to pass this puppy up. I think these sales are great places to pick up unusual souvenirs. 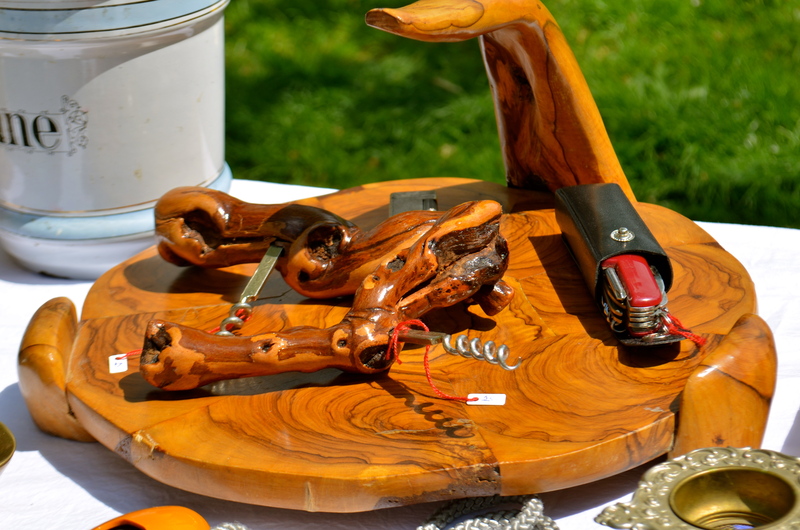 We’ve had visitors pick up paintings, books, beer steins, cool glasses, tastevins, vintage t-shirts, Swiss army knives and other cool Swiss army gear at the flea market. I got a couple of Swiss army knives, a couple of old champagne buckets (to use as planters on my balcony), a leather purse big enough to hold my giant camera (super cute for summer), and a Sherlock Holmes book (in French). While I didn’t need any of it, apparently I could live without it. I love these sales because you never know what you will see. They are like a mini cultural time capsule. 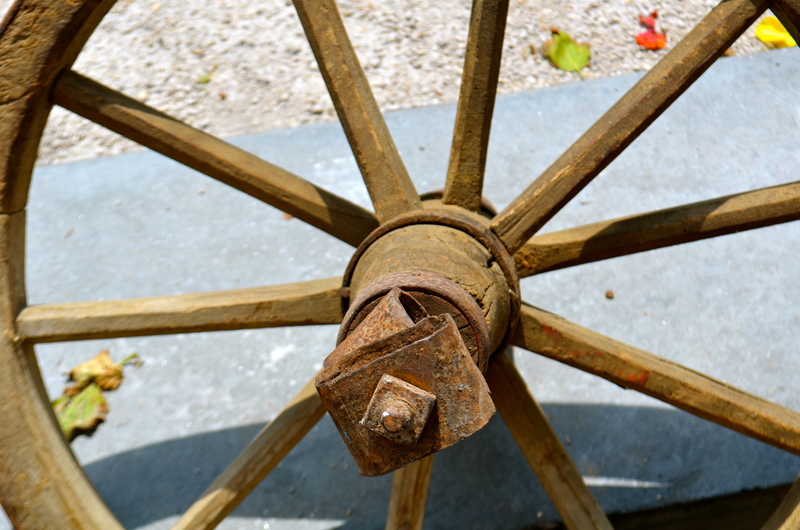 Although you might be able to find an old wheel in the US, you probably won’t find some old spraying equipment or watch parts. 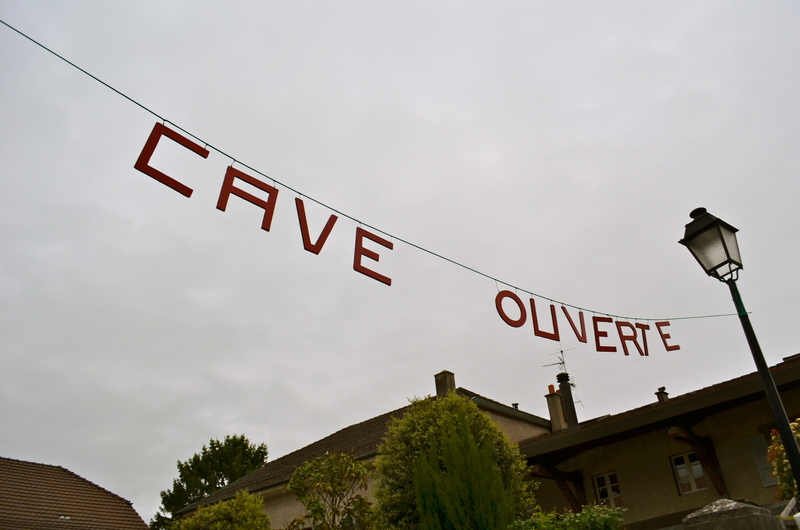 Last weekend was Geneva‘s Caves Ouverts. 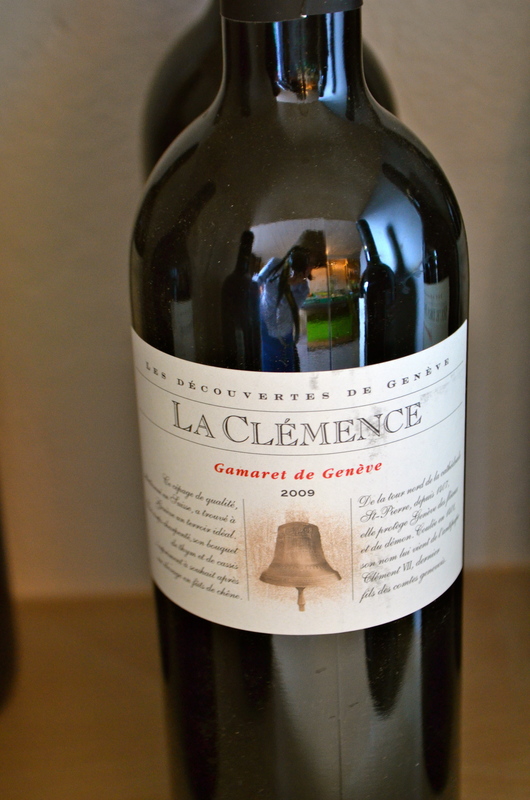 This translates to “Open Cellars.” All of the area’s wineries were open for visits and to taste the latest wines. 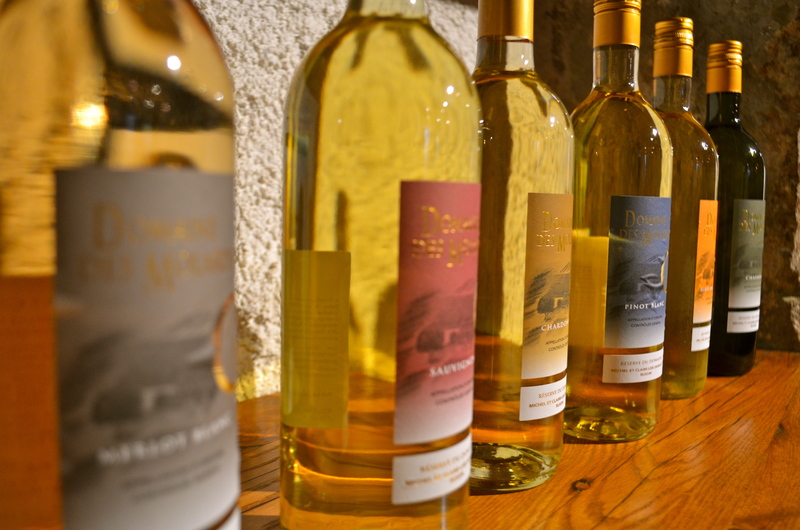 Wines produced for consumption within a few years are usually bottled in March or April. As a result, they are first released for sale in May. Since it started in 1987, it has grown into a huge event. Buy your tasting glass and we will gladly serve you. The glass is 5 CHF. Taste moderately. Love passionately. We bought special wine glasses for five Swiss Francs ($6) each. 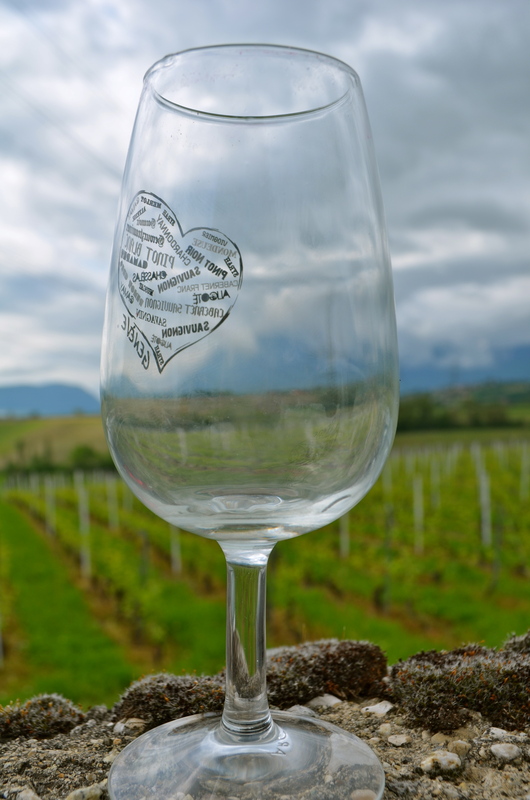 With these glasses, we could taste any wine at all the wineries. 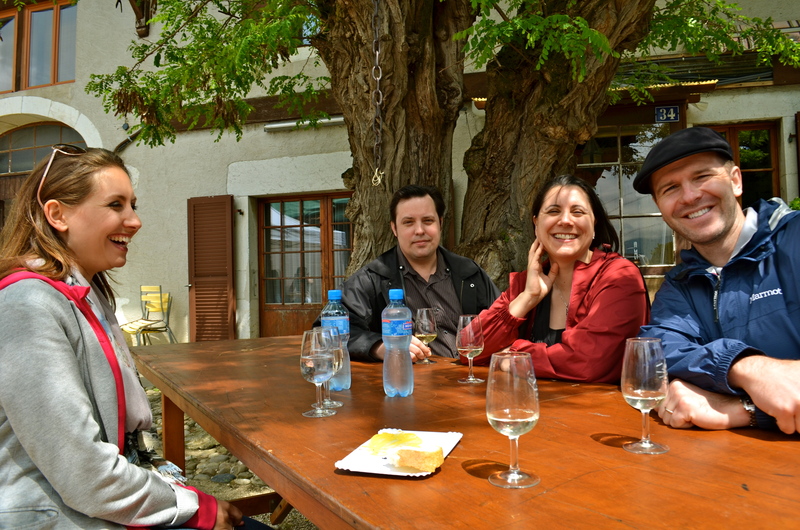 The proprietors were great an were happy to talk about their wines. 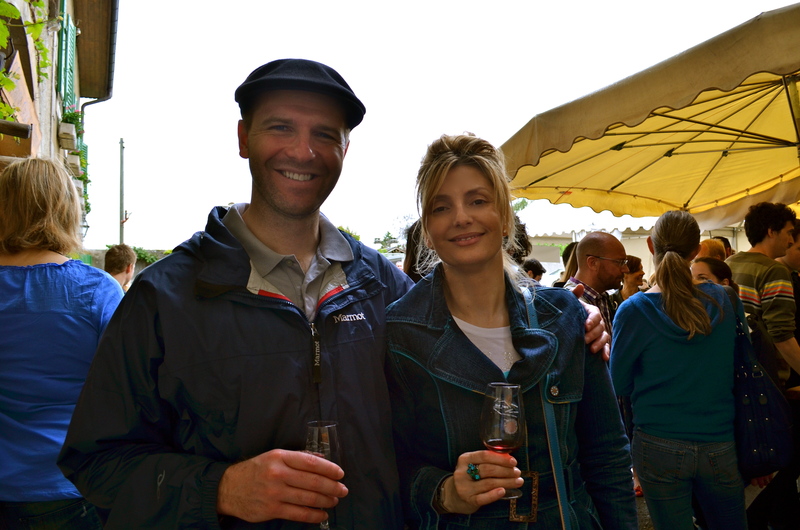 I was glad that we’d done the wine tour of Burgundy and learned how to taste wine so that I knew how to tell them what I liked. 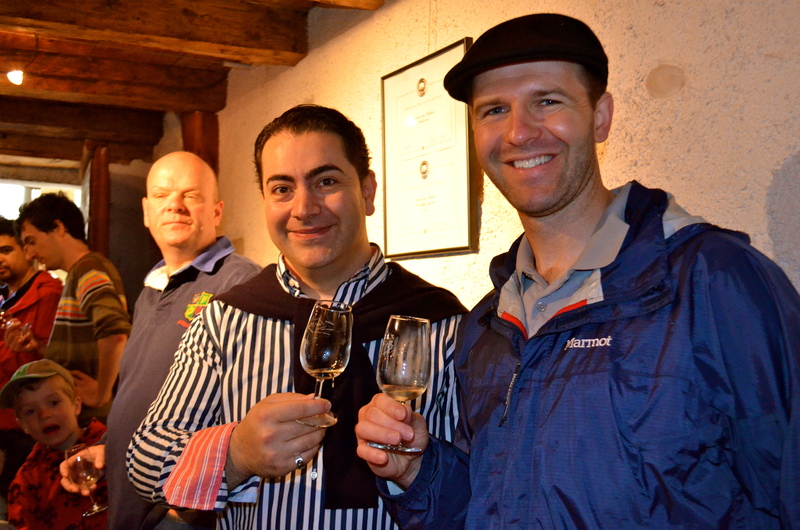 As a result of the tasting, we are now a bit more knowledgeable about Geneva’s wines and wineries. We didn’t buy any since we didn’t have a backpack with us (rookie mistake), but will be heading back to buy our favorites. I like that you can see my reflection in the bottle. 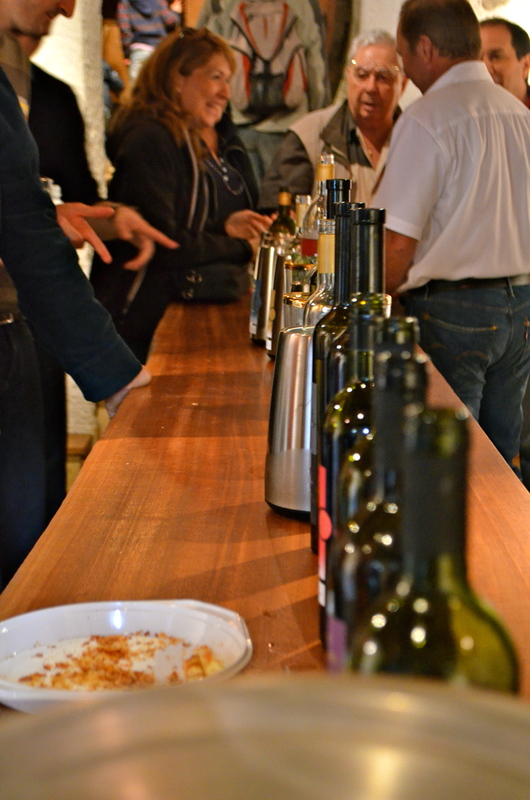 Most of the wineries provide tasty food at reasonable prices. We opted for the sausage. They had a choice of white or red and asked which I would like. I asked for the red sausage please. Others in our group had the Tomme, a wonderful goat cheese. They served it grilled on bread. 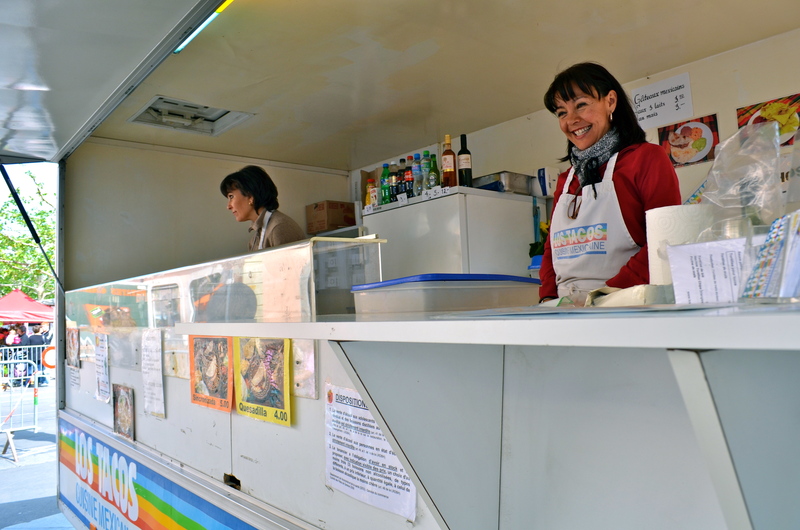 We also saw: Tartiflette, hearty meat dishes, wonderful pastries and pies. 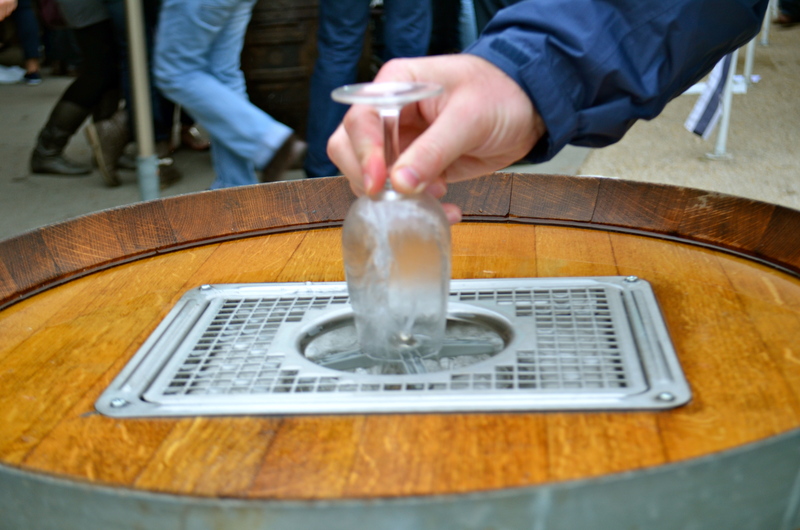 Many wineries also provide entertainment. Accordion music anyone? 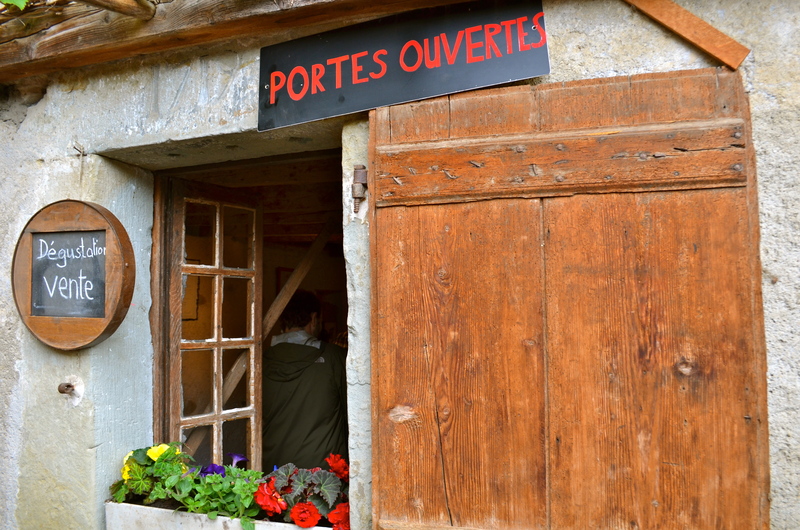 If you are thinking about visiting Geneva, Caves Ouvertes is the weekend to do it. The countryside is beautiful. So are the vineyards. I love that you can always see the mountains in the distance around here. Even the towns are picturesque. 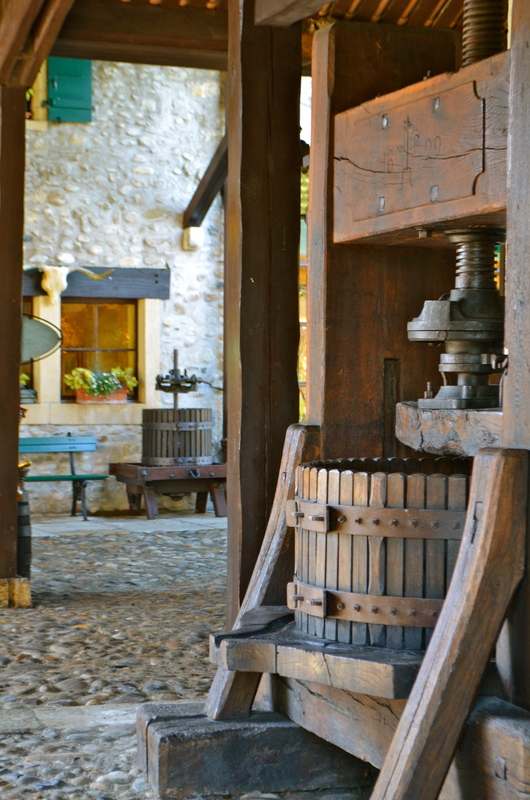 These old villages consist of stone farmhouses and massive wood barns in which people gather around barrels or picnic tables. 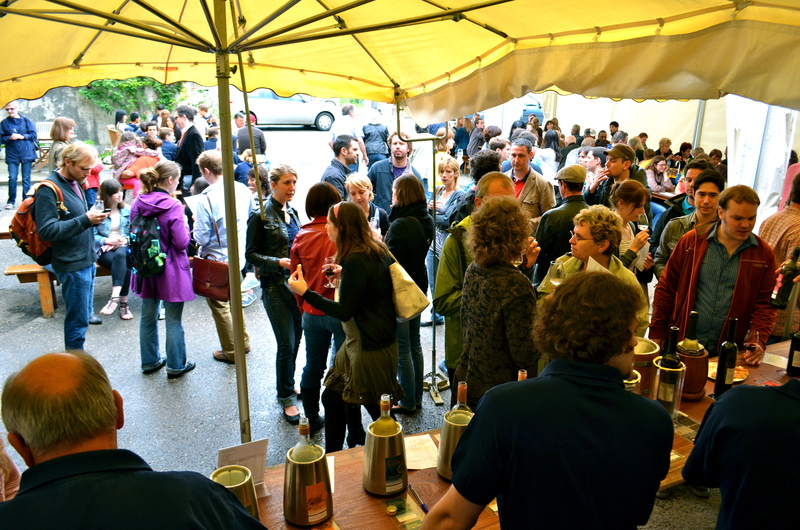 As the day progressed the crowds grew, spilling out into the courtyards and the streets. It was a wonderful atmosphere. Everyone was very friendly. Even the usually reserved Swiss were wonderfully chatty. We went with a group; it was great to share the day with people from all over the world. As the crowds increased, the weather deteriorated. Being the idiots that we are, we dressed for the morning’s weather (another rookie mistake). In Switzerland, the weather is changeable and the temperature dropped drastically over the course of the day. He wore shorts and flip-flops (not very Swiss). I wore a skirt and wells (also not very Swiss). At least he remembered to bring a jacket. Yep, the wind was blowing so hard that it turned the umbrella below inside out. 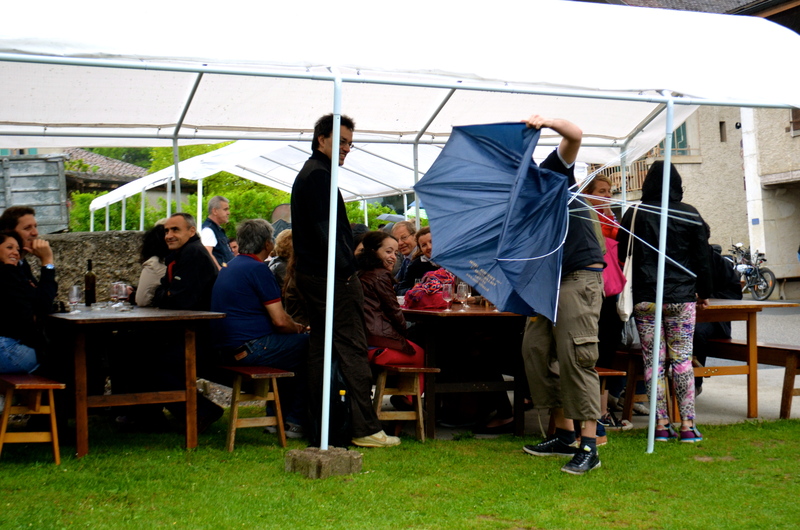 We had umbrellas too. Unfortunately, they didn’t do a lot of good when the wind was blowing sideways and we called it a day. 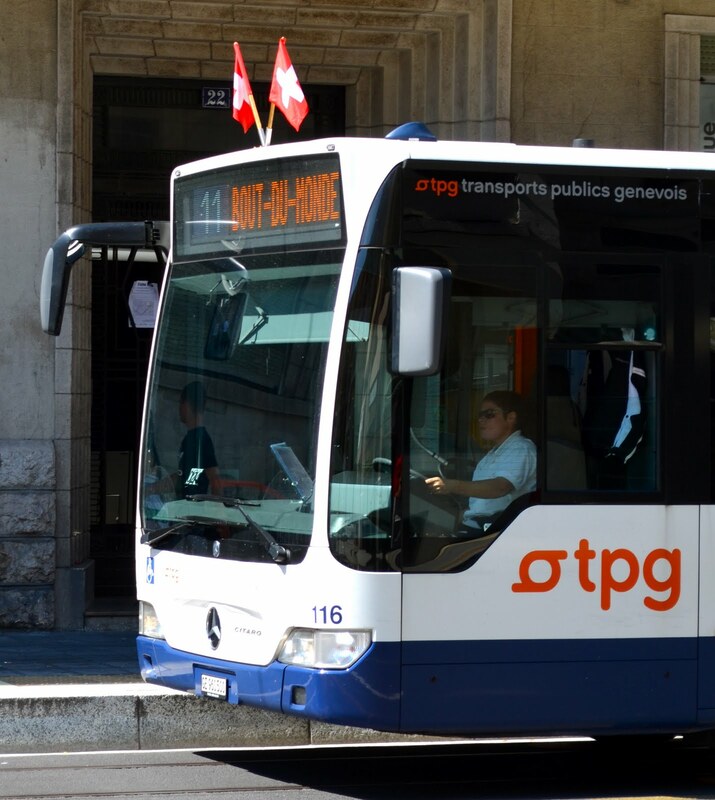 I have grumbled discontentedly about Geneva’s public transport (TPG) since they drastically changed their routes in December. After they provided free shuttle buses that loop around the wine villages, I feel much more kindly disposed towards them. Thanks TPG!